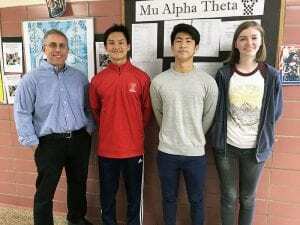 Tappan Zee High School seniors Lawrence Choi, Kevin Huang and Logan Tabor advanced to the New York State Math League (NYSML) Championships on April 6 at Middletown High School after the school’s Math Team earned the top score in Rockland County in the New York Mathematics League for the 11th time in the past 12 years. Kevin was the high scorer on the Rockland team at States, and Logan was voted team MVP. Senior Palak Oza and freshman Henry Huang also qualified for States, but were unable to attend due to other commitments. Lawrence, Kevin and Logan all trace their Math Team beginnings to Math Olympiads at Cottage Lane Elementary School. “Competition math is very different and a lot more fun than regular, structured math classes. It’s more about finding patterns and is much more satisfying solving a math problem in class,” noted Lawrence. “You apply everything you’ve learned over the years and that’s exciting,” added Kevin. “I am consistently amazed by the caliber of math students who join the team. Kevin, Logan, Palak, and Jennifer Nguyen have been an integral part of the program for the past four years and they will surely be missed. Yet there are always other enthusiastic and brilliant students who follow. I think this speaks in part to the quality of our mathematics program at TZ,” says Math Team advisor and teacher Seth Resnikoff. Congratulations to the TZ Math Team and Math Department!